The details in cutting hair are the difference between a good haircut and a bad haircut. 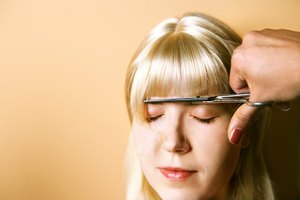 Point cutting is a technique used to texturize the hair. It removes bulk from the ends of the hair so that layers and gradation blend better, creating great movement in the hair. Point cutting can be used on men and women and is a wonderful tool if your haircut isn't sitting quite right. Pick up 1-inch sections and comb the hair straight out from the head. Hold hair 2 to 3 inches from the ends so that the hair sticks out vertically from your fingers. If you hold the hair too far from the ends, it will fall over and be difficult to cut. Position scissors perpendicular to your fingers so that they are parallel with the hair. Open and close scissors, then remove. You may not see a lot of hair removed with each cut; this technique is used more for texture than removal of length. Remove more hair with each cut by positioning the scissors at a slight angle. The more severe the angle, the more hair will be removed with each cut. Repeat steps 3 and 4 until desired amount of hair is removed. Be patient when point cutting. It can seem easier to hold the scissors at more of an angle to remove more hair all at once, but the hair will lay better if you use a slight angle and take your time.